Stuart is a handsome boy who looks like he belongs in the pages of an Orvis catalog, the ideal embodiment of a purebred hunting dog. For reasons that were never clear to us, Stuart’s family in Florida didn’t want him any longer, even though they kept their other two dogs. Was it because he was deaf? We don’t know. But here at the ranch Stuart turned out to be a perfect gentleman, a very well-mannered housedog who gets along with everyone. Not only does he look like a classic Beagle, he sounds like one, too. He loves to rush up to us, stand up on his hind legs with his front paws on our legs, and after we pet him, he throws his head back and starts baying and baying! Soon after arriving, he found his true calling in life, which is to groom other dogs. Stuart offers this service free-of-charge to anyone who will stand still for him. 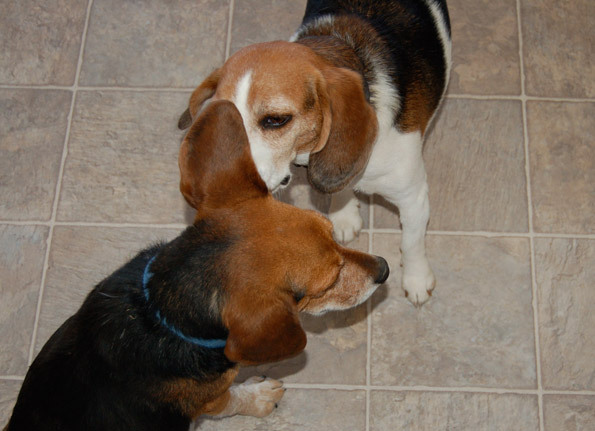 In fact, it’s often how he greets dogs, by rushing up to start cleaning their ears. For some, it’s a bit off-putting for a first greeting (“You want to do what?”) perhaps a canine social faux pas yet for others it’s a great way to get acquainted. Whether it’s a “hi-my-name-is-Stuart-can-I-please-clean-your-ears?” introduction or a casual after-lunch grooming session, rarely does any dog refuse to let Stuart do this. When that rejection does occur as it did once, when we heard a brief ruckus and saw an upset Stuart scurrying away after blind Evelyn, hackles up, sent him packing Stuart is dejected. Yet only momentarily, for there are more than 40 other sets of ears to clean around here. 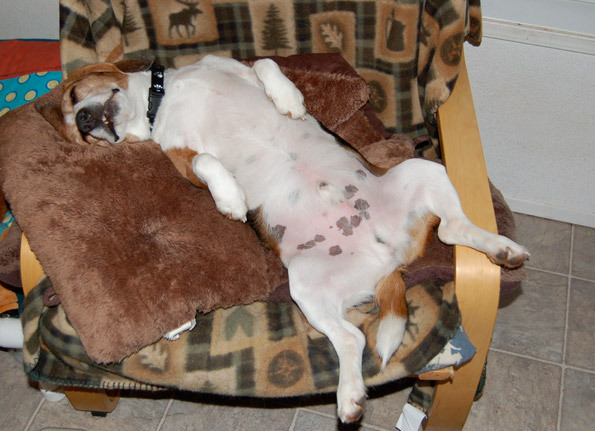 Like our other disabled Beagles, Stuart is an intense sleeper, sprawling across chairs and beds in a decadent way. 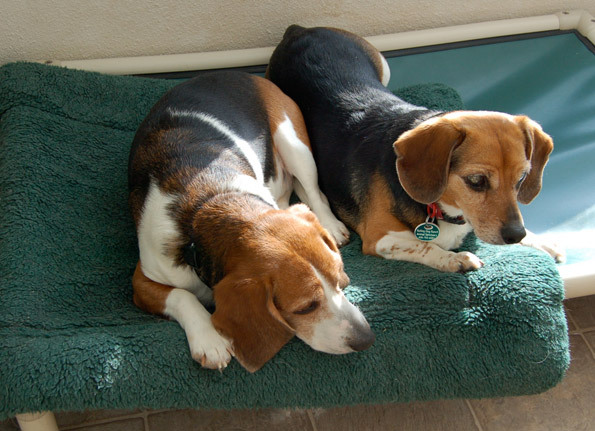 Because he’s deaf, though, he sleeps more soundly that the other Beagles! 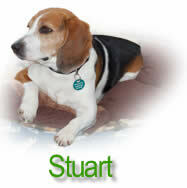 For an update on Stuart,?click here.